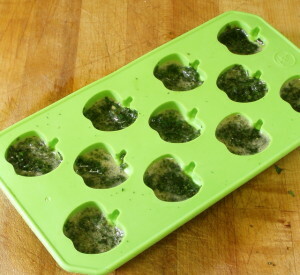 In my last post, I casually mentioned throwing a frozen cube of basil into something I was cooking – and realized I had never written about freezing herbs. For years, I looked at the fresh herbs in the market, but didn’t get them, because I lived alone, and would rarely use the whole bunch before it wilted. I mean – I tried all the tricks… standing with the stems in a jar of water (a good way to spill water in your fridge – at least for me…) wrapping in a damp paper towel in a zip bag, keeping in a vegetable keeper (which worked best for me) but they still really didn’t last for more than a few days. And, while for some herbs, fresh is nice, but dried is perfectly all right – for others (basil, dill, parsley) you really do totally different things with the fresh herbs. 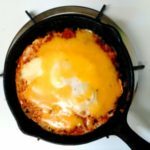 But there is still more than I can guarantee using in a week – especially if it is a busy week, or a bad migraine week, or for any other reason a time I’m not doing a lot of cooking or finding recipes. But I have discovered that I can freeze them, and they can still be used for most of the recipes in which I’d use them fresh. 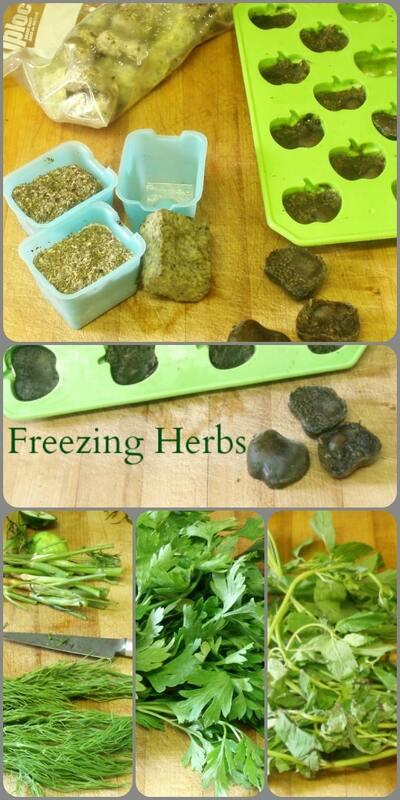 I can’t just freeze the herbs by themselves – they’d get freezer burn, and dry out. But I can freeze them in olive oil, or butter, or water. (Other common oils don’t solidify enough.) 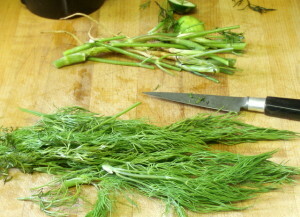 I choose the medium by the recipe in which I am most likely to use the herb. 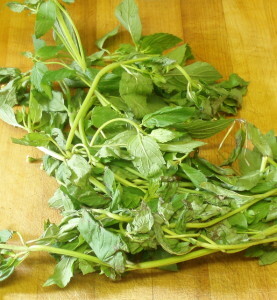 Will I drop oregano into a salad dressing, or pasta sauce, or a Greek bean dish? I use olive oil. 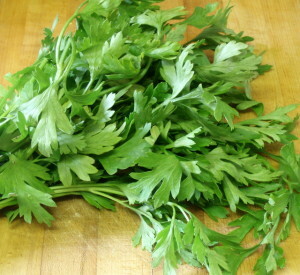 Will I use the parsley to dress up plain rice, or gild the lily on a steak? I use butter. Will I add mint to a smoothie or iced tea? I freeze it in water. 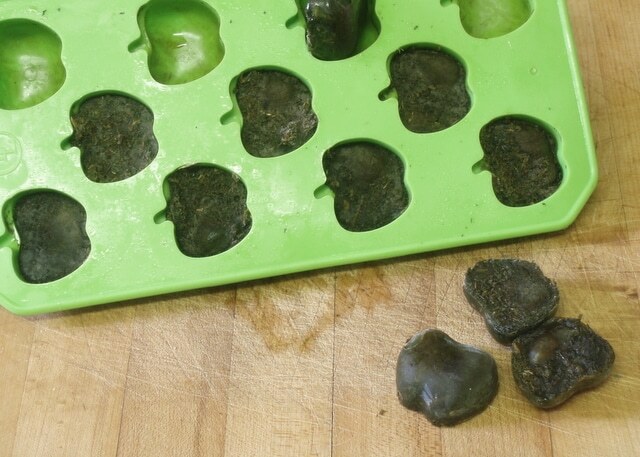 I’ve seen attractive cubes of frozen olive oil with a few whole sage leaves delicately placed – but I don’t have the freezer space for that. And, really, the texture is compromised by freezing, though the flavor is not. 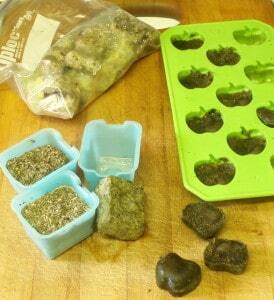 I find that freezing works best with chopped or pureed herbs, where I don’t really notice that. 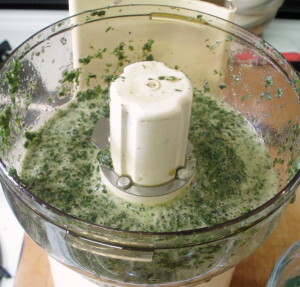 So I use either the blender cup or the mini processor to puree the herbs with just a small amount of oil or water. One exception – sometimes it is nice to have decorative pats of herb butter, for an elegant presentation. 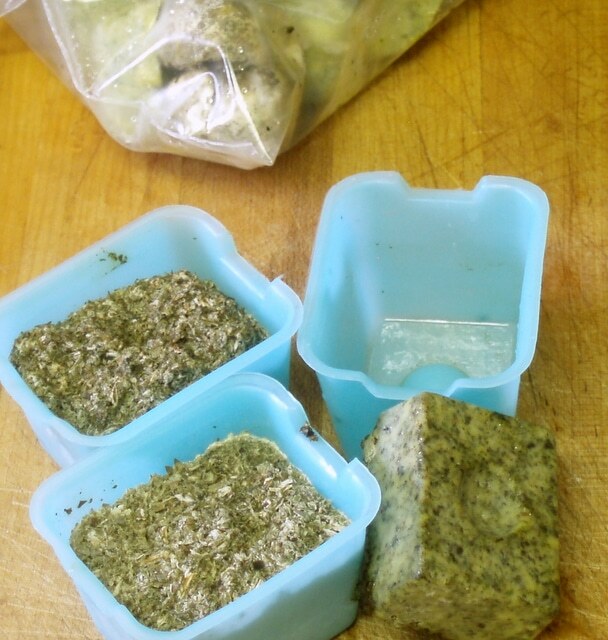 If I am making them, and will use them soon, I use plenty of butter and a smaller amount of herbs. I can, though, barely thaw my frozen puree, mix it with more butter, and make decorative pats with that, if I want them much later. 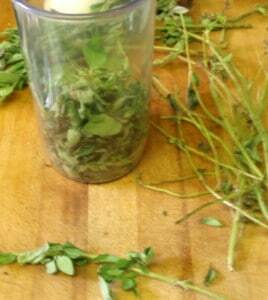 I strip leaves off any fibrous or woody stems. Sometimes this means all stems… usually it is just the larger main ones. 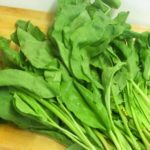 Then I chop the leaves roughly before putting them in the blender – just so I don’t have long strings of parsley stem, or one or two big sage leaves getting caught in the blade. 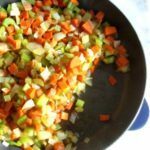 I always use the mini chop with butter, or if I want a coarser chop – but otherwise, it’s pretty much whichever is handy at the moment. First, I just give the leaves a quick whir – but they do really need the medium to blend well, so I add a little oil, slightly softened butter, or (in this picture) water. 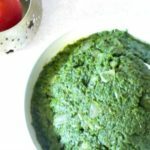 I can’t really give measurements – you need to start with however much of the herb you have that you want to freeze, and go from there… with just enough fat or liquid to allow it to blend. The puree often separates a little, so I spoon it into the tray to freeze, and I try to make sure each little space has roughly equal amounts of the slurry at the bottom. Then I top them up with the liquid. (This is not an issue with butter.) In this case, with mint blended in water, I put roughly 2 teaspoons in each apple – which will be plenty in a pitcher of iced tea, or a mint salt lassi. When they are frozen, I pop them out and put them in their own zip bag. It is lovely and refreshing now – but it will be next winter, when I have a summery mint beverage, that I will really appreciate them! This is such a good idea! We love basil, but it never seems to keep long enough for us to use the entire bunch. Freezing it would be the perfect way to use it for our favourite pesto recipe at a future date. That was it! With just two of us, I simply didn't buy fresh herbs for years (which was a pity itself...) But now we're in a CSA, and we often get bunches of herbs. I couldn't use them fast enough, and hated to waste them! What a fantastic idea! Every summer I end up throwing out fresh basil because I grow too much and have no idea what to do with it (there's only so much pesto sauce I can eat!). 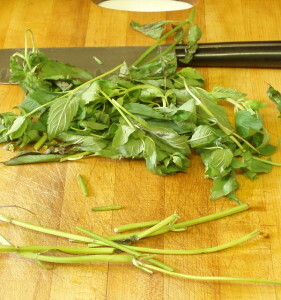 I also love the idea of having fresh mint for iced tea and making my own herb butter. Perfect! I hate wasting good food... LOL and I love having fresh tasting herbs year round. Win, win! Thank you! This is brilliant! I always hate wasting the herbs I don't use completely. I'll have to try this next time! Thanks! Terrific! I hope it works as well for you as it does for me.